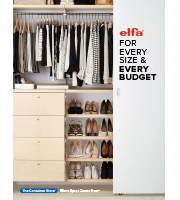 Keep your jewelry, small accessories and perfumes right in reach with our exclusive Elfa Décor Accessory Shelf. The lipped design keeps your accessories organized and easy to see, but still contained. Hang up to ten pairs of pants on our exclusive Birch Elfa Décor Gliding Pant Rack. Non-slip rings keep pants in place. Mounted on two Elfa 16" Ventilated Shelf Brackets, it provides great flexibility for placement in your closet. Our Elfa Decor Classic Knob measures approximately 15/16&quot; diameter x 3/4&quot; deep. It is slightly convex in shape - perhaps its shape is more easily discernible in a different finish (shown below). Are these for Elfa only or can they be used on kitchen cabinets? What are the dimensions of this knob? Our elfa decor Classic Knob measures 15/16&quot; diameter x 3/4&quot; high. I am trying to coordinate drawer pulls with an antique cupboard in my elfa closet and would like the dimensions (size) of the classic knob drawer pull and screw please.